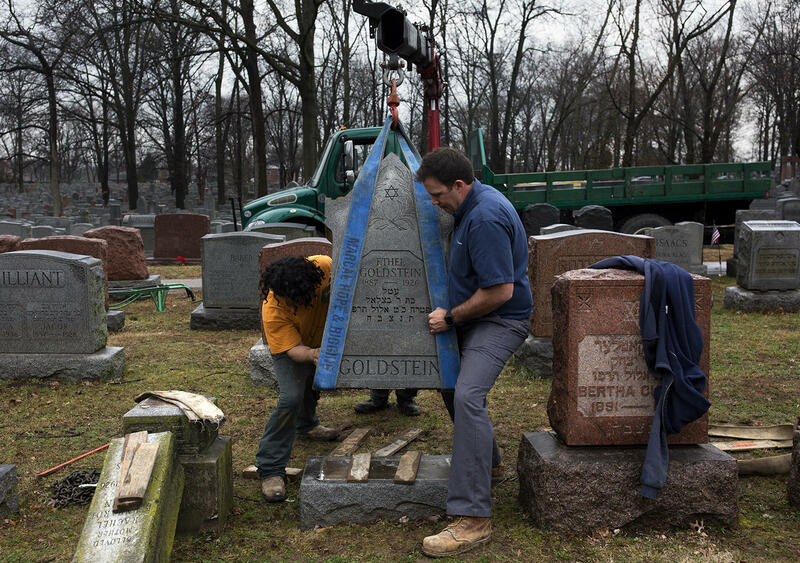 Workers with Rosenbloom Monuments Company re-set headstones at Chesed Shel Emeth Cemetery on Tuesday morning. She said she cried when she saw the extent of the damage. “This is horrible. And the families, they have to go through a grieving process all over again,” Feigenbaum said. It isn't clear exactly when the vandalism occurred, but it comes at a time of another round of threats called into Jewish community centers around the country on Monday. The St. Louis area received two such threats in mid-January. Police haven’t said whether they believe it was a hate crime, but several community members and Gov. Eric Greitens believe that’s just what it is, especially coupled with the recent spate of threats made against Jewish community centers around the country, including the one in St. Louis. The Anti-Defamation League is offering a $10,000 reward for any information on the vandalism. Rebecca Wu, a spokeswoman for the Federal Bureau of Investigation in St. Louis, said the bureau was aware of the incident. “If in the course of the local investigation, information comes to light of a potential federal civil rights violation, the FBI is prepared to investigate,” she said. President Donald Trump said Tuesday that the recent threats against Jewish community centers are "horrible and painful." It was the first time Trump directly addressed the wave of anti-Semitic incidents. Many headstones remained toppled over Tuesday morning as crews worked to re-set them. Chesed Shel Emeth started accepting burials in 1893. Most of the damage was concentrated in the older section of the cemetery, where workers from Rosenbloom Monument Company used heavy equipment Tuesday to right the gravestones. Late Tuesday night, the cemetery posted to its Facebook page a list of the blocks of graves with damaged headstones, rather than the family names of those affected, citing privacy concerns. Greitens will bring a team of volunteers to the cemetery Wednesday to help with cleanup. Also Wednesday, a group of Jewish cemetery and funeral directors plans to meet to best discuss how to figure out next steps. “We’re going to come together, and help the director of Chesed Shel Emeth where we can, and brainstorm to see among ourselves what we can do better to guarantee the sanctity and the safety and security of our institutions,” said Barry Needle, the executive director at three Jewish cemeteries in the area. The Jewish Federation of St. Louis has set up a fund to help cover repairs and security needs at the damaged cemetery, which is also accepting donations directly. At the cemetery, where the usual peace and quiet was broken by workers’ diesel engines, sisters Nancy Giannasi and Lori Frieze were relieved to find the graves of their grandparents and great-grandparents were still upright. “I think it’s white supremacy,” Giannasi said. Rabbi Hershey Novak of the Chabad on Campus Center at Washington University, said seeing the damage brought up a range of emotions. Adrian Levin, of St. Louis County, visits Chesed Shel Emeth Cemetery to check on the headstones of his wife's relatives. "The first reaction is disbelief. The second is shock and horror. And then after a little bit of time, it gives away to a sense of guarded optimism," he said. "Optimism because the outpouring of love and respect and support from so many parts of the community, all over the country, is very, very heartening." He added that he's heard from people who don't live in the area anymore, but whose family members are buried there or at nearby Jewish cemeteries. "And they’re obviously outraged – and they’re also more than outraged. They’re also in a state of limbo," he said. Visitors walk through Chesed Shel Emeth Cemetery Tuesday morning to check on the graves of their loved ones. Leora Spitzer was waiting in her office Tuesday morning to find out whether the graves of dozens of relatives were among those damaged. Spitzer, who works at the Jewish Family and Children’s Services, said her family learned about the vandalism as they gathered to mourn a great-uncle who had just been buried at a different location. “The look on their faces, that absolute devastation that this could happen here, that’s something that’s going to stay with me,” Spitzer said. Spitzer said she had no doubt the vandals knew it was a Jewish cemetery. “That cemetery is full of Jewish stars, it’s full of Hebrew,” she said. “This was an attack on my community, on my family, and on me." U.S. Rep. Lacy Clay, D-University City, called the vandalism an "appalling and shameful act of anti-Semitic hatred," noting that the cemetery is a "historic final resting place for generations of St. Louis' Jewish community." Mufti Asif Umar with the Islamic Foundation of Greater St. Louis said in a statement that the organization condemned the acts. The Missouri chapter of the Council on American-Islamic Relations and the Imam Council of Metropolitan St. Louis said they will encourage Muslim congregations to donate money to help repair the cemetery. St. Louis County Executive Steve Stenger wrote on Twitter that the vandalism was "disgraceful and cannot be tolerated," and St. Louis Mayor Francis Slay tweeted that those responsible "are a disgrace to our region." The University City City Council said in a statement that it “stands with our Jewish friends and neighbors in expressing our outrage and deep sadness at this vandalism on the sacred ground at Chesed Shel Emeth Cemetery." In Jefferson City, the Missouri House observed a moment of silence at the request of Rep. Stacey Newman, D-Richmond Heights, who has family buried at Chesed Shel Emeth. "Let us condemn those who have carried out this act of hatred, and let’s remember the family members today whose grief is overwhelming,” Newman said in a brief speech on the House floor.